An invisible hem is a hem that is 'invisible' on the exterior. Instead of a top stitch there is a only a tiny stitch that pokes through to the exterior. Small enough to, in most cases, become swallowed up by the weave of your fabric. If you take a pair of pants or skirt with no visible exterior stitching and tug a little bit on the inside of them hem you'll see the tension from those little stitches. This stitch can be done by hand but this tutorial is for accomplishing the hem with a machine blind stitch. Begin with a finished edge to your fabric. In this instance the raw edge has been serged but if you can also have a finished edge with seam tape or a folded under edge. On the inside of the fabric pen your hem to the desired length. Next, take the folded edge and fold it towards the exterior. Leave just shy of a 1/4 of an inch of your hem exposed next to your new folded edge. Pin. Now it is time to sew. Put your blind-stitch foot on your machine. This foot varies from machine to machine but typically it is a foot which has enough room for the needle to do a zig zag stitch and it has a short wall to keep your folded edge separate from your originally raw edge. Follow your machine's instructions for selecting the blind-stitch type of stitch. here is how it looks on my machine. Place your fabric in the machine with your foot as shown in the photo. The fold should be just touching the small wall of the foot. Begin to sew. Your machine will stitch a straight stitch in between intervals of a single zig zag stitch. This interval can be changed with your stitch length. It is this zig zag stitch that 'grabs' the exterior of the fabric in small and 'invisible' way. Once you're done stitching, remove your pins and iron out the creases from your folds and you're done! You've got a beautiful hem that no one can see! Need a project idea? How about taking a too-long thrift store find and updating it by shortening it and finishing it off with an invisible hem. i want an "about" page. I never knew what that stitch was for. I have bookmarked this for future reference. Thank you. thanks for that tutorial with a practical application. 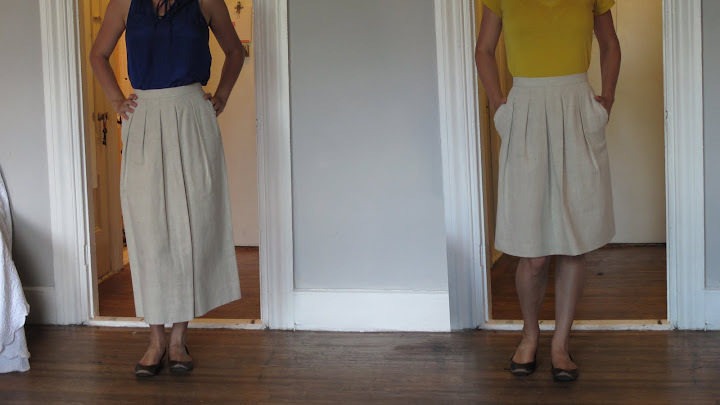 I love the skirt transformation and now I want to find a rather frumpy ol skirt to modify.